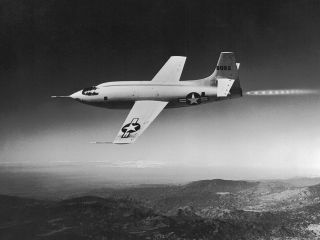 A photograph shows the rocket-powered Bell X-1 supersonic plane during a test flight. Breaking the sound barrier was a challenge of engineering. It was also incredibly, and perhaps maddeningly, loud. In the heady days after the end of World War II, back when NASA was NACA (the National Advisory Committee for Aeronautics), going faster than sound meant finding a willing pilot, building a capable plane, and then tearing up an empty swath of sky over a vast and unpopulated desert. Chuck Yeager did it first, in a loud NACA plane called the Bell X-1. From there, it was a short leap to jet fighters, the most common form of supersonic craft today. In the war theaters and training grounds where supersonic fighters operate, their supersonic booms are at most a secondary concern. No one's worried about noise pollution when bombs are falling. But turning that innovation, the ability to travel faster than sound, into a viable, commercial business? That's a harder project, and one far more bound up with problems of noise than it is with the physical limitations of existing craft. There was, once, a supersonic airliner, built by a British and French partnership, and operated primarily by British Airways and Air France. Called the Concorde, it could make the flight from New York to London in 3.5 hours, under half the time of a normal, subsonic airliner. And that flight path was great for supersonic travel, since the Atlantic Ocean between those destinations, like the deserts beneath NASA's X-1 test, is both vast and devoid of people. The loud roar of the plane was irrelevant almost all the time. "Loud, unexpected noises — bangs, booms, roars, screams and others — are not simply nuisances. The human body automatically responds to them as warnings of danger, triggering basic physiological responses that prepare the individual either to fight or to flee. Such primal responses occur following laboratory‐generated noises that are less loud than those produced by the Concorde, the British‐French supersonic jet that landed for the first time in New York yesterday, and most other aircraft. The coming of the Concorde or, more likely, its going — since takeoffs are much louder than landings — is likely to produce a new wave of worries about such responses." Throughout its operational history, from a first flight in 1969 to the final grounding of the fleet in 2003, the Concorde was beset by complaints from the people who had to hear it. Balancing the function of the plane, and the extraordinarily fast travel it provided, with the impact on anyone else who might have to live with the loud jet, was an enduring challenge of the Concorde's operation. "Rarely if ever in the past has government provided the forum for so dramatic a confrontation between man's technological ingenuity and his concern for environmental quality as in the controversy over the Concorde Supersonic Transport," Robert B. Donin, an official in the U.S. Department of Transportation, wrote in 1976. Quiet supersonic, then, is an attempt to do with modern materials and engineering techniques what the engineers of the 1960s were unable to do: craft a plane that delivers all the speed of supersonic flight, without upsetting any of the groups that mobilized against the Concorde in the past. It is a dream of technological progress for a few without upsetting the lived realities of the many, and if quiet supersonic works as planned, then the second age of civilian supersonic flight will not be defined by one oddball airliner. Instead, it could lead to a quick spread of superfast, extremely quiet travel, shortening the flight times between all sorts of destinations, not just long hauls over open sea. And, if NASA's quiet supersonic efforts pay off, there's a chance those same principles may even work their way into the design of new, deadly, and now silent, fighter jets.